The unique patented and trademarked triangular shape of the TriMaxx® vial provides more space for dosage and refill information. The flat panel design allows the customer to read the instructions without having to rotate the bottle. A larger font size can be used, making the information on the TriMaxx® absolutely the easiest to read of any Rx container on the market. What's more, your older customers will LOVE the size and shape of TriMaxx, since it's easier to hold making cap removal a breeze for seniors. Tri Maxx® is the easy solution for compliance with FDA side effects and warnings requirements. 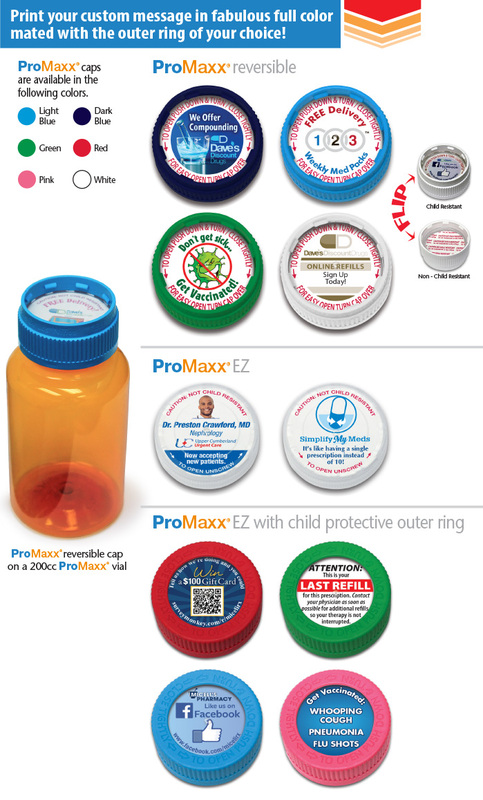 These messages can be easily grouped on one panel in larger print to prevent accidental misuse of the medication. In addition, the vial is manufactured using Tri State’s unique dual resin capabilities, which means it is available in polypropylene or universally recyclable PET resin from FDA approved post consumer materials reducing dependence on precious natural resources and protecting the environment. Extra benefits of the flat panel label are that it is easier to read. We have divided the information in a logical two-panel format, which allows better label adherence and larger fonts that are easier to read and understand. "We are using the 3rd panel to advertise other services that we offer and to say thanks for the business. For example we use our flu shot ones when we have flu shots to give to remind people and promote the shot, we advertise the durable medical equipment that we carry, we talk about our delivery service as well as our drive thru." "We are using them (TriMaxx) to promote our Simplify My Meds, compounding, our luncheonette, and flu shots. We have had a lot of customers ask about certain things after seeing it on our bottles. We are very happy with the ability to advertise on our bottles." "I wanted to take a moment to let you know how helpful the 3rd panels have been in our retail pharmacies! We have recently created a medication synchronization program and the 3rd panels have greatly assisted with helping to get the word out to patients. Not only are these available at little to no charge, but they are professional and colorful in appearance. Thanks again for this offering! "With the millions of prescription vials and stock bottles that our pharmacies use each year, we saw an opportunity to positively impact our environment by partnering with Tri State Distribution and our customers to cut down on waste while saving energy. Our customers appreciate that we can help them to safely and confidentially recycle their empty prescription medication vials. In addition, we love the ability to customize our messaging on the ProTect® lined caps. These caps provide us with another method of communicating to our customers about events and services that we believe add value to their experience at our Big Y Pharmacies. From Flu shots, to our Inform and Inspire Wellness Events and even our upcoming 80th Anniversary, the cap liners give us a unique mechanism "to talk" to our customers on a daily basis." Nicole D’Amour Schneider - Big Y Foods, Inc.
"If you don’t consider everything from floor to ceiling, from inside to outside to be an asset of value to your business, then you are missing an opportunities to grow your business. This has been our thought in using the TriMaxx® vial's 3rd panel. There are services to promote, there is public service information that shows your community involvement, there is always something else you can tell patients about living with their diagnosis. Use the help of Tri-State's staff to create and use a library of TriMaxx® vial 3rd panels. Mix it up! You want to create such a degree of variety that patients and their caregivers look forward to seeing what they can learn next." To find out more about more about the Third Panel Marketing System, contact TSD by clicking here. • Triangular shape is easier to hold and more stable. • 30 percent more space for imprinting messages provided by third panel. • Larger print size is easier to read and more FDA compliant. • Third-panel used for in-store promotions or national brand coupons. • 360º marketing assistance provided through QTrak™ program. • All three bottle sizes — 75cc, 120cc and 200cc — use the same caps. • Two-component, one cap C/R system for all bottle sizes reduces inventory. • Seven SKU C/R and non-C/R system frees up bin space and streamlines filling. • Larger size prevents dispensing one prescription in multiple bottles. 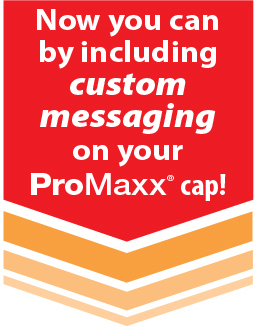 If you’re one of the thousands of pharmacies who like the ProMaxx® in either version for its ease of use, dual purpose operation, and customer satisfaction, you’re going to LOVE our new custom messaging option - which is available to you at NO ADDITIONAL CHARGE! 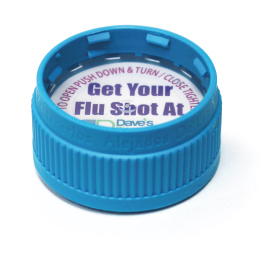 This fully custom marketing feature is available on all ProMaxx® caps we produce, and turns your pharmacy caps into personal billboards that allows you to send your pharmacy right into each customer’s home! These come to you with custom liners already inserted – your staff doesn’t have to do a thing. Just fill the vial, wrap the label, and cap as normal, and you’ve created a custom Pillboard® that your customer will see each time she takes her meds! Does your store feature DME, compounding, pet meds, med sync, home delivery, weight loss clinics, immunizations and more? Then don’t let your customers leave your store without a message right inside the cap informing and educating them about one or more of those services, right where they will see it every time they take their meds. It’s like taking your pharmacy into the homes of your customers, instead of worrying about how to get customers back to your store so you can tell them about the other things you do. Look, the reimbursement situation is only getting worse. Pharmacies who want to survive in today’s market can no longer afford to wait for customers to come to them. By learning new ways to market, promote and communicate with your customers, ESPECIALLY when they aren’t in your store, you can not only survive but THRIVE!